Archives of Eaton Bray News for May 2010. 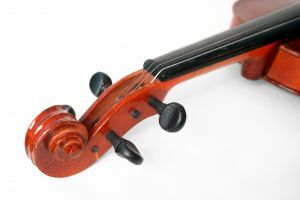 This article was published in May 2010. Please see Latest News for more recent information. Eaton Bray lawn tennis club is a friendly social club seeking to introduce or re-introduce new members to tennis. The club is hosting a number of events designed to encourage existing and new members to get actively involved in both social and competitive tennis and to improve their game through private or group tuition. Aimed at seniors who wish to take up tennis or for those of you who wish to blow the cobwebs away before getting more serious. Come to our play day. Meet some of the members, hit a few balls, get some free pointers from our coach, let your children play some mini tennis. Get half price membership. Come along to our junior open day on bank holiday Monday (31 may) from 2pm or turn up on any Monday 4-6pm or Saturdays 10am-12.30pm. Contact our junior co-ordinator or coach to find out more about our discounted membership and lessons. Seniors are welcome to attend our open sessions from 10am-12pm on Sundays and 6pm-8pm on Tuesdays. For more information please contact visit the club website www.ebltc.org.uk. Highlights from May's parish council meetings held on 10th & 11th May 2010, along with a downloadable copy of the full minutes are now available from the Parish Council website. The next Parish Council meeting to be held at the Coffee Tavern on Monday 7th June 2010 at 7.30pm. NOTICE IS HEREBY GIVEN that the Central Bedfordshire Council have made an Order the effect of which will be to prohibit any vehicle, except a vehicle being used for fire, police or ambulance purposes in an emergency, from proceeding along that length of the B4506 Dagnall Road, Eaton Bray which extends from north of the B489 roundabout, south east to a point 30m south of the junction with the B4540 and for 20m both sides of the roundabout into Tring Road, Eaton Bray and Icknield Way, Eaton Bray. This temporary closure is required to enable surfacing works to take place and shall apply to such extent as may from time to time be indicated by the appropriate traffic signs. Where possible access will be maintained to property and premises but may be restricted from time to time according to local signing. It is expected that the works will take place on ONE WEEKEND - Saturday 22 May 2010 and Sunday 23 May 2010. Closure times are 8.00am to 6.00pm. Proceed south on B4506 to roundabout with A4146, Dagnall. Take 3rd exit and continue on A4146 to junction with Northall Road, Eaton Bray. Turn right and continue on Northall Road then Totternhoe Road to junction with Castle Hill Road, Totternhoe. Turn right and continue on Totternhoe Road to junction with Dunstable Road. Turn left and continue to junction with B489. Turn left and then take 3rd exit at roundabout on B4541 Whipsnade Road, continuing to roundabout with B4540. Take 3rd exit and continue on B4540 to site and vice versa. Access from A4146 to B489, Northall Road to Eaton Bray and Dunstable Road to B489 will be signed accordingly. The Order will come into operation on 22 May 2010 for a period of four months or until the proposed works have been completed, as detailed above, whichever is the earlier. On Sunday a young Bray team containing five players under 18 (and only 2 of over 25!) travelled to neighbours Mentmore. Mentmore won the toss and were persuaded to bat on good looking pitch. Roff and Tickell opened the bowling and both bowled very well keeping their lines tight and not allowing the batsmen much room to score runs. They were backed up by good fielding from the young side and Tickell made the early breakthrough by taking the wicket of Kirchner snr for a duck. Baines followed not long after, bowled for 17 with both Roff and Tickell constantly missing the outside edge with late swing. Recent recruit and resident 16 year old Holbrook with his leg spin joined the act with a ball that clearly wasn't in batsman Lewis' arc and bowled him for 8 to leave the home team in a bit of trouble close to drinks. Opener Nutley was still going though and quietly went to 40 before also being bowled by Holbrook with a turning delivery. Skipper Peacock rotated his bowlers often and debutant bowler Ross Taylor was unlucky not to pick up his first wicket for the club after Ryan Peacock dropped a powerful hit shot backward of square off the youngsters bowling. Veteran dangerman sayers coasted to 83 not out along with Newton who hit 63 not out and Mentmore ended on 238-4 off their allotted 40 overs. Bray fielded very well and can be happy with their efforts, with a few exceptions and Jake went into tea as normal, happy. The break seemed to drag on longer than normal as both teams listened to England smashing the Aussies in the 20/Twenty final before realising a game of their own was still to be completed. Ryan Peacock opened up with Roff, a combination not used before and the result seemed to be effective enough with the explosiveness of Peacock coupled with the steadiness of the latter. Things were going along fairly well until Roff was sent back for 4 by Kirchner. Ryan continued in his normal vain scoring at a good rate and hitting regular boundaries as well as clearly doing damage to Mentmore's Nutley in the process who took no further part in the game after trying to catch a fiercely hit hook shot. Unfortunately he got out not long after for 17 bowled by Sayers and was followed by Tickell for 3, trapped lbw by a typical full ball from the same bowler. Captain Peacock in at 4 started the rebuilding process along with vice skip Jones and things went along fine for at least an over, until Roff triggered Barm for 5 to a delivery that was heading well towards fine leg! Daniel Vettori a.k.a Matthew Ringsell joined his young skipper and a partnership was built as both players picked off loose deliveries as well as being careful in valuing their own wickets. When Ringsell departed for 11 Peacock jnr was joined by Eaton Bray stalwart Lewis Taylor who rolled back the years patiently rotating strike for his skipper to keep the runs ticking along. However, the run rate was rapidly rising and with the radio at full blast on the boundary Josh decided to listen to the finale of the World Cup final and hit a loose drive to backward point for a well grafted 58. Lewis was joined by Curtis Anthony who hit some good shots on his way to 11 not out but for all the efforts put in by all eleven players, the asking total was always going to be a bit out of reach as they finished on 154 all out. A really good effort and every Bray player on the day can be happy with effort put in. The independent Local Government Boundary Commission for England (LGBCE) is asking people in Bedfordshire to comment on proposed new local electoral arrangements for Bedford Borough and Central Bedfordshire Councils. A public consultation on the recommendations begins today and will end on 12 July 2010. The reviews will decide how many councillors should sit on each Council and will also establish new boundaries for local wards. The Commission's draft recommendations, published today, include maps of the proposed new wards that each councillor would represent.The recommendations will be available at council buildings and libraries shortly, and are available online at www.lgbce.org.uk. Max Caller, Chair of the LGBCE, said: “Having fair electoral boundaries for your council is important. Our reviews aim at ensuring electoral equality, meaning that each councillor should represent a similar number of people. "The information that people and organisations sent us in our earlier consultations have informed our draft recommendations. Your ward should be a realistic reflection of your community area. We want people to tell us whether the boundaries we've drawn make sense. Rivers, roads and railways make effective boundaries but it's not always that clear cut. We now want people to tell us what they feel the impact of the recommendations will be on their community, whether they think the recommendations can be improved and, if so, how." Information & Advice on Home/ Leisure and Personal Security. Eaton Bray Village Hall Car Park, Eaton Bray on Sunday 16th May 2010 13:00 - 16:00. The Bray Sunday team travelled away to Bourne End CC hoping to carry on their long unbeaten run of 1 game. Skipper Peacock won the toss and decided to bowl on a typically sticky wicket and slow outfield. The opposition got off to a solid start negotiating the opening spells of 72 year old veteran Georgie Coughtrey and the flight and guile of Joe Roff. However the introduction of Jaco paid dividends with a superb caught and bowled effort to remove Pateman and then Akhtar for 70 assisted by a brilliant one handed catch from wicket keeper Bob "The arrogant one in the helmet" Warner. Jacobs, intending to be heavily involved in the game, then caught a sharp catch at short cover to give Roff the wicket of Ashburner. Barm took the important wicket of the dangerous Baber and of Sattar in a great spell of 2-7 off 5 and was aided in both wickets with good catches from McDermid who tested the wind as the ball was on its way down. There was also a wicket for Peacock and good spells from debutant leg spinner Holbrook, Curtis Anthony and Kerins. Special mention to Coughtrey who was smacked everywhere in his second spell of 3 overs by Andrew Symonds lookalike Adam Dukes who fed him some generous buffet bowling. Bourne End ended on 230 for 6 a target that the Bray thought would be within their reach with the batsman they had in their side. Bray opened up with McDermid and Jacobs and there was an early breakthrough when the Aussie trumpeter was bowled for 0 (although he will tell you, "at least I didn't leave it! "), I'm still trying to work out if this is an achievement or not! Skipper Peacock joined Petrus Jacobs and both began to dominate the bowling bringing up the 100 total in 12th over. The pair smashed the ball everywhere and Jacobs hit his first century for the Bray, (we are awaiting his jug sometime this week) in a second wicket stand of 176 which ended when Peacock fell to Dukes for 83 a knock which included the ball once unfortunately denting Bob Wankers lovely BMW roof. 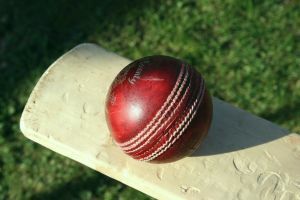 While the batting innings was taking place, there was drama unfolding on the sidelines where apparently the cocky and arrogant Warner was berating the opposition team mates, their abilities and Roff joined in doing something similar in regard to the facilities, though the police still haven't confirmed this. Paul Jewell joined Jacko and hit a quickfire 6 and was soon followed into the pavilion by Jacobs who made a quite brilliant 120. Wanker and Kerins finished things off with 10 and 7 not out respectively and unfortunately for the tea lady he hit the winning runs also. A huge win for Bray with a quite brilliant batting effort and they finished the innings chasing a big total down in just 22.4 overs. Rumours around the villages say that Mentmore may not be looking forward to next week's game. Highlights: Jacko Jacobs 120 Josh Peacock 83 EBCC innings second wicket partnership 176 between Jacobs and Peacock in 13 overs! Throughout June 2010 Bedfordshire Artists will be opening their workshops and studios to the public in the Beds Open Studios Event. Three local artists Christine Gallagher, Andrea Girling and Victoria Johns will be taking part. 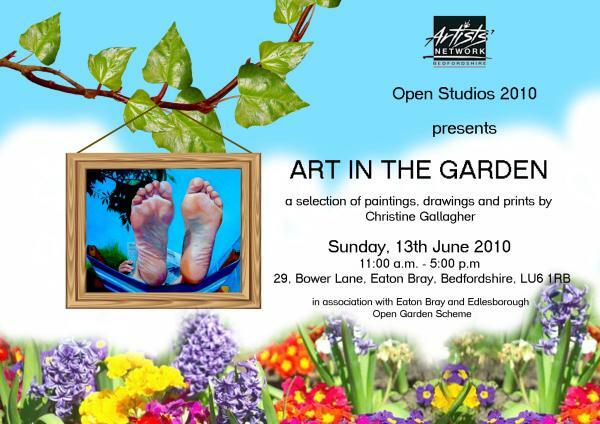 Christine Gallagher will be holding her Open Studio event during this year's Open Gardens event on 13th June 2010. You are viewing the May 2010 archive.